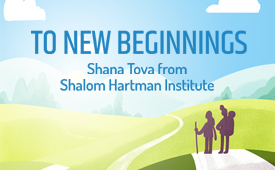 Hartman Institute scholars have many insights to offer for the High Holidays, Rosh Hashana and Yom Kippur. In these articles, essays, videos, and educational materials by Hartman scholars and participants in our rabbinic programs, you will find items of interest, enlightenment, and joy. We have classic articles from David Hartman and Donniel Hartman, as well as practical and challenging articles and videos from many other scholars and faculty. The State of Israel Ministry of Foreign Affairs and the Shalom Hartman Institute invite you to explore the diverse meanings of Jerusalem. In the Gates of Jerusalem, is a curated selection of traditional and modern sources. For those who with the time - and don’t we all wish we had the time - this year we are offering in-depth treatises and study guides you can download, print, and explore even when your computer is turned off. In "Yom Kippur: Why Doesn’t It Work Outside of the Synagogue? 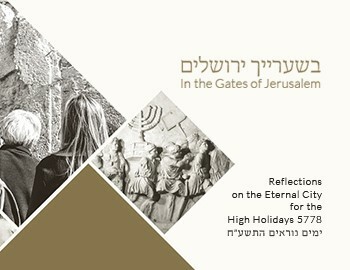 ", Shalom Hartman Institute President Donniel Hartman writes about how "Yom Kippur is a synagogue success story" that does not translate into action afterward, and suggests how Yom Kippur must become a catalyst for a new culture amongst the Jewish community, a culture which fosters individual responsibility, reflection, and a commitment to being a tshuva person. In "The Akeida: A Window Into God’s Humanity And Our Own," Shalom Hartman Institute founder Rabbi Prof. David Hartman wrote about how he struggled to understand the "Akeida," the Binding of Isaac, a story read during the High Holidays. "In attempting to understand the God of the Akeida, and what the Akeida might mean for us today, I have found it helpful to look at God as a parent," he wrote. Donniel Hartman: Yom Kippur: Why Doesn’t It Work Outside of the Synagogue? Shraga Bar-On: Yom Kippur: Yom Kippur: A Jealous God or a Compassionate God: How did His 13 Attributes Develop into 'Attributes of Mercy'? Shraga Bar-On: For Yom Kippur: A Jealous God or a compassionate God: How did His 13 Attributes Develop into 'Attributes of Mercy'? Micah Goodman: Tefilla and Teshuva: Does God Change Our Mind?